The Ten Essentials is a tried and true list of should-have items for outdoorsmen. It was developed in the 1930s by the Mountaineers, a climbing group in the United States of America’s Pacific Northwest region. Most of us spend more time daydreaming of granite spires and alpine lakes than traveling in those areas. In reality, we spend our days in cubicles, patrol cars, or running errands around town. Today we’ll look at how to adapt the time-tested Ten Essentials to our every day urban context. 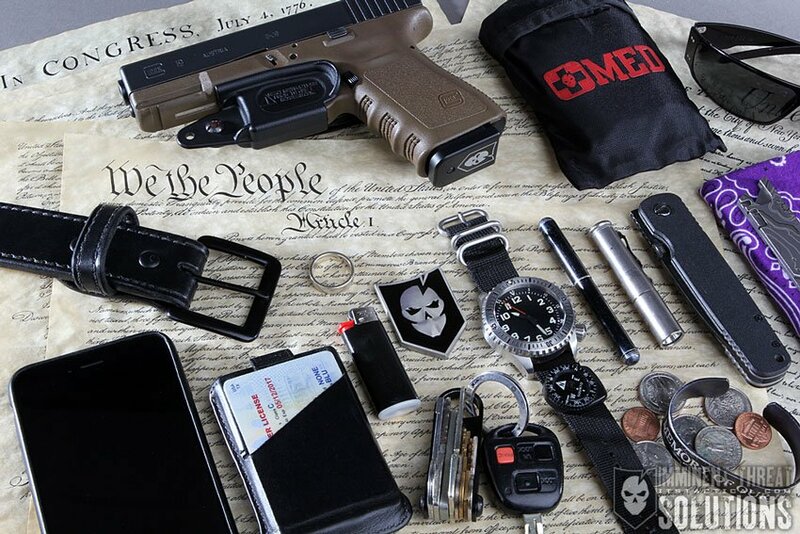 The Ten Essentials may overlap heavily with our everyday carry (EDC) items. So why would we temper our EDC with the Ten? 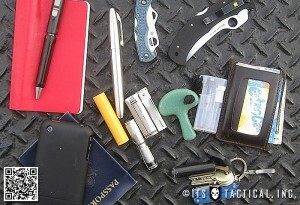 Many of our individual EDC lists are haphazard and unstructured. By adapting our EDC to the Ten Essentials and committing the list to memory, we can go down the list by the numbers and lessen our chances of forgetting an important item. How many times have I forgotten to take my first aid kit out of my climbing pack and put it back into my laptop bag before leaving for work Monday morning, or left my lighter and energy bar in my suit jacket while hastily going out the door for dinner in my casual clothes? If we mentally run down the list when we move items back and forth between our various bags and pockets, we may have something brought to our attention that was previously overlooked. That item may have remained ignored had we not systematically categorized our EDC. How could we adapt these ten items to our daily lives in an urban environment? The compass is a no-brainer, but instead of maps most of us rely on GPS. If this is the case for you, packing an extra battery for these units is a smart move. Maps are especially important when traveling out of town. The American Automobile Association is a good source. For more detailed maps, DeLorme State Atlases are a good buy. If you’re staying at a hotel, ask for a business card with a map and address on it. 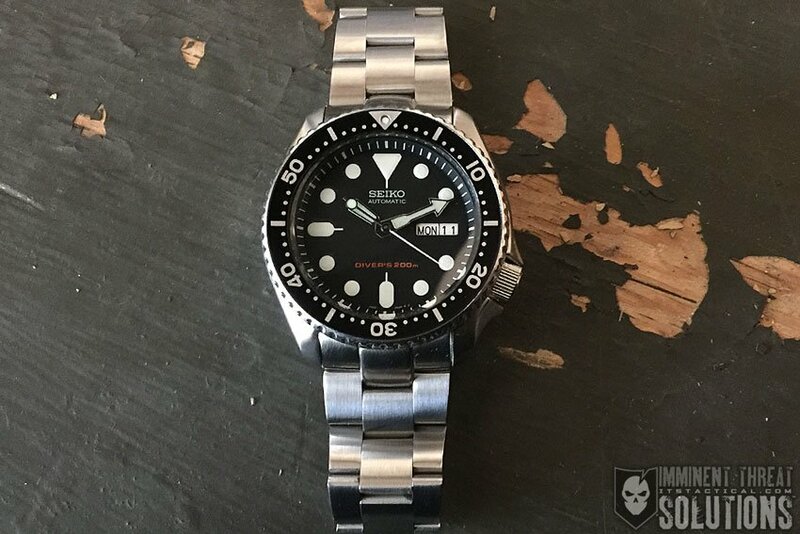 If you have a compass watch such as the Suunto Vector, don’t forget to recalibrate it and set the declination when you arrive at a foreign destination. Look up the declination on an updated table, as this changes every few years. Editor’s Note: See our LandNav 101 series for more on compass selection, navigation, and declination. I don’t wear a tiger stripe boonie hat daily, but I use this category to remind myself to bring my sunglasses. Some folks like to EDC sunscreen for health reasons. Your grandma probably nagged you to grab a jacket before you headed outside. You’re a big boy now, but your grandmother is still right. You should be prepared for the worst your town has to offer at any given time of the year. Some folks like to EDC extra socks and even keep spare footwear with them. This is handy if you wear uncomfortable dress shoes, especially so for you ladies in high heels. REI has affordable, store-brand merino wool socks (stock up when they go on sale for $5 every few months). They may not be as nice as Smartwool or Darn Tough Vermont, but they won’t break the bank if you want to wear wool socks every day. The traditional Ten Essentials suggests carrying a headlamp with a spare lamp and batteries. I find it much simpler just to carry two lights. Given that the majority of a light source’s bulk is made up of the lamp and batteries, it doesn’t weigh much more or take up much extra space to carry a second light. A good way to go is a clippy flashlight such as the Surefire A2 Aviator backed up with a headlamp like the Petzl Tikka XP. The headlamp is obviously nice if you need your hands to be free, but I find walking at night with a handheld flashlight easier when reading the terrain. This has been covered at length by folks much more qualified than myself. I personally use freezer bags, safety pins, duct tape and Vitamin I for most of my first aid needs, but if you really want to be prepared, there is always the ITS ETA kit. Don’t forget your prescription medicine. Make sure you carry a notepad and pen; if you render aid to someone, take copious notes on the patient’s condition and actions you have taken to care for the patient. You will need to pass this information on to emergency services personnel when they take control of the scene. It’s debatable whether we will need to start a fire to save our lives in the city, but it’s always handy to have a butane lighter around. In my outdoor kit I carry two, and leave some cotton balls massaged with petroleum jelly for tinder in a film can in my first aid kit, along with a sparker device. Some of the fancy outdoor storm-proof lighters recommend running off of triple-refined butane that you can find at smoke shops. I confess I don’t EDC anything more than a single Windmill lighter, as Los Angeles doesn’t really get cold and wet except for maybe a week in February. For outdoorsmen, this is typically where the knife, duct tape, sewing kit, and Krazy Glue go. A roll of duct tape may be bulky, so I like to wrap some around my water bottle. 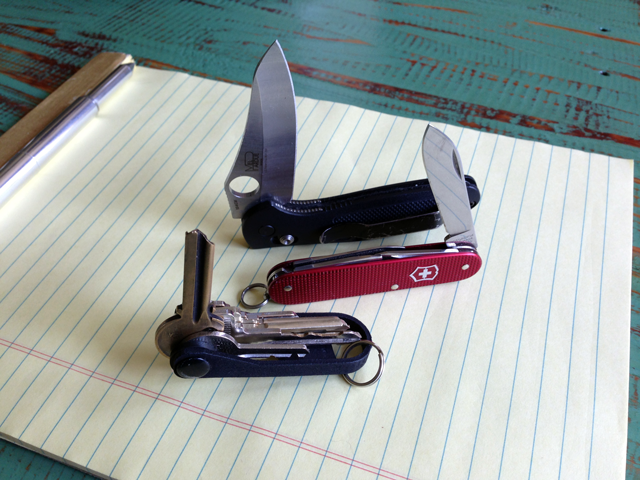 For us city folk, we often are able to get away with just a folding knife and a multi-tool. I like to have some relatively healthy snacks in my pack so that I’m not resorting to fast food all the time. I also carry a titanium spork and some hand sanitizer. Give some thought as to what you throw in your bag. Some things travel better than others. The first thing folks often think of to toss in their bag is an energy bar, but some of these have frosting and chocolate chips that may not hold up to the heat if you leave your bag in the car. I personally like a mix of dried fruit, candied nuts, dark chocolate and buffalo jerky, as my body tends to crave different things depending on activity level and the time I last ate. Obviously a water bottle or a hydration bladder fills this requirement. For those of us living in the USA, the water that comes out of our toilets and showers is cleaner than the water much of the world has access to. (A fact for which we should be grateful for on a daily basis.) I don’t say this just to be patriotic, but to bring to mind that many Americans who do not do any overnight hiking or travel to developing countries take for granted that a very basic need is available to us at the thoughtless flip of a lever. Whether that lever works or not is is dictated by a chain of events which we have no control of. It’s prudent to have extra water in our vehicles and homes. Water is heavy but we should carry a reasonable amount with us. I don’t like drinking out of a hydration bladder daily, so I just carry two water bottles and leave one in the fridge while sipping from the other. Make sure you test your supposedly “leakproof” bottles for leaks before putting it in the same pack as your laptop or other electronics! Also, the water bottle is handy for air travelers who fill up when they pass through security and so avoid getting gouged at airport coffee shops. If you want to be super prepared, you can carry around a water purifier. I do when in foreign countries. Even if countries like Hong Kong and South Korea are debatably more high-tech than the United States, their municipal water systems are questionable and may or may not be safe to drink from. You probably don’t need a bivvy sack in an urban environment. Getting indoors should be a simple affair, especially if you have your own vehicle. That said, a folded up trash bag takes up hardly any space and weighs very little. The simplest thing to do in case of inclement weather in an urban environment is to put on a jacket (see Insulation). It goes without saying that what outdoorsmen pack should not be limited to the Ten Essentials. Other items such as signaling (cell phones, signal mirror, whistle), hygiene (baby wipes, soap, trowel), bug dope, and a camera all go along with most outdoor parties. Some outdoor organizations have adapted the list for their own use and given it a name like the Ten Plus Essentials. While it is commonsense that you should think beyond the basic ten, the point here is to memorize the time-tested standardized list in order to quickly go through your checklist without having to worry about overlooking anything. The vast majority of us carry our wallets, cell phones and keys even if they don’t necessarily have a “survival” purpose. If things change for the worst, a seemingly inconsequential item may become critical. Mentally organizing your EDC checklist into the Ten Essentials will decrease the chances of you forgetting such items. Remember what your grandmother said: don’t forget your jacket — and your navigation, sun protection, illumination, and I hope you remember the rest! Editor-in-Chief’s Note: Please join us in welcoming Jeff M. as a contributor on ITS Tactical, Jeff works and resides in Los Angeles, where the four seasons are mudslides, earthquakes, riots and wildfires. He is an avid shooter of both firearms and camera, and celebrates his American heritage by playing the 5-string banjo. Check out his website at www.skunkabilly.com.